Thank you to Clancy Tucker for this interview. I'd appreciate it if you take the time to learn more about me and my passions! Nearing Completion of My Memoir! It's been nearly six years since I was approached by family and friends to begin writing my story. In between that time, I've written my first children's story, and turned the corner on my journey from parenthood to an ending of one marriage and onto a path of redefining myself. I've remarried a wonderful, supportive man, and I've returned to diving into art and writing. Though I still have a long way to go from rough draft to publication, I thought it might be fun to share a few excerpts from my story, which will be unnamed just yet...(I have a working title, but that won't be revealed until book launch time). *I’ve got to get away. I was breathing hard in the pitch black of night. An evil thing was chasing me, but I ran in slo- mo, and the beast was gaining on me. This dark force was just inches away. I could feel its sinister presence, its hot breath—and it was not man-sized, but colossal. I was trapped in its shadow. I knew if it seized me, that was the end. I never quite saw the face of the monster—in this recurring dream—but the terrifying feeling was the same. If I didn’t get away, I was dead. As I was fleeing this devil, I realized I had the power to fly, if only I could get off the ground. It seemed as though I was running and running and running, but as I watched my feet moving beneath me, I didn't get anywhere. The sidewalk was gliding under me, like a conveyor belt in reverse. I remained stationary. Then, just when I thought the beast would swipe me with his death claws, I finally rose off the ground, and flew higher and higher until I was well above the giant, murderous fiend. I soared above the trees, over or under the telephone lines and I actually felt the sensation of flying in my dream. My arms were out to my sides like Superman, the wind blowing my hair like his cape. The trees below me were vibrant green, and I could see miniature people playing in yards, dogs running, and the farmers’ fields below, with smoke coming from the tractors. The sky was the most magnificent shade of blue. This was so astounding! I could fly. And I was safe. She pressed her head against the barrel of my brother’s rifle and pulled the trigger. It was a .12 gauge shotgun he used for hunting. I don’t remember why it was lying there on the couch. But I do remember her crying and yelling in the kitchen just before she entered the living room, where my sister and I were. Nancy was babysitting for two little kids. She immediately ushered them outside to play. “Well then, I may as well not even be alive!” Mom had shouted through her tears. She'd come storming into the room and saw the gun and grabbed it. She was drunk, fumbling to get it in position. Then? What did the then come after? Why was she so hopeless that she’d want to kill herself? Always so much drama—marching into the living room, propping the gun in such a way that she could point the long barrel at her head and find the trigger to pull it. It clicked three times. The gun was empty. She knows there aren’t any bullets in it, I thought. Yet I was afraid that the gun might fire and perhaps she would actually kill herself. I stood by watching her, feeling numb. I was only 12 years old. I loved my mom. That emotion birthed my fear of losing her. I also hated her at times. Overshadowing the fear was a survival method to get through this episode of her emotional manipulation. I numbed myself to the behavior, learning to survive the hurricanes that had devastated our home. I believed she was vying, in some sick way, for attention. And actually, she was. I had witnessed many outbursts of her anger, and crying, but was too naive and young to enter into or even understand her pain. She was an alcoholic. I was experiencing a sense of abandonment, and I was angry. She was thinking only of herself. What about us? She wanted an easy exit from her troubles, leaving us kids to figure out life for ourselves. Or maybe it was her depraved cry for help—a very outward display to reveal to us, her children, that she was hurting beyond hope. What should I do? I wanted to blink and have it all better. But I couldn’t fix it. That's all for now. There's a lot more to chapter one, which sets the stage for the rest...Maybe next time, I'll add an excerpt from another chapter. I've been on some formidable adventures...gale force winds (hurricane) on the North Sea, floodwaters on a six month Mississippi River adventure, bicycle trips, mountain climbing, and a decades-long test of endurance with the man I called my husband. But who thought he was my master, my judge, my punisher—even the Holy Spirit himself. This is the story, not of self-discovery, but one of re-discovery, when I finally had the courage to face lies, defy the man, and also stand up against the tyranny of spiritual forces. I was delighted to read to the 2nd and 3rd Grade classes at a Brookfield elementary school. These students engaged in intensive conversation about bullying and how to prevent it in their school and neighborhoods. I was happily surprised by the knowledge and thoughtfulness of these young, bright kids! They had the opportunity to purchase my book and get an autographed copy. You're invited to the next Book Fair and signing at Maxwell Street Days, on Saturday, July 30th 2016. Located in Downtown Port Washington. The Author festival is near the Duluth Trading Co., and Smith Bros. Coffee House. Come find me! Purchase some stylish underwear, grab a brew and then settle down to read your new books, or walk around the festival. Opens at 9am and runs until 4pm. I am giving 10% off the price of the book at the fair or online for the month of August. Mention "Days" online to receive your discount. Just a reminder! This Sunday, June 5th from 1-4pm, near Carol College: EB Shurts Building, 810 W. College Ave, Waukesha, WI. 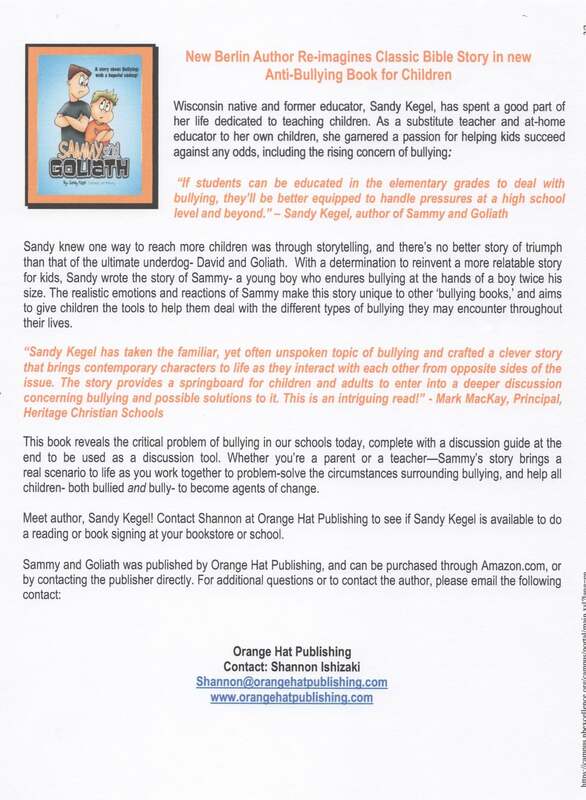 Orange hat Publishing is hosting a 5 year reunion celebration...Please come to my next book signing here, as well as other local authors, there will be several book launches on Sunday, and things for kids to do to get them loving books. Bring your kids and grandkids to meet real authors!! I will be at a table selling my books at 2pm, though they will be available all day. Barnes and Nobles is now carrying my books at the Mayfair Mall location! You can find it in the religious section, though I'd like to see it under the "Social Issues" section. Where else can you find my books? The Little Read Bookstore in Wauwatosa, Martha Merrell's Bookstore in Waukesha, and Elmbrook Church's Bookstore, or look online for the distributors such as Amazon, and of course, you can order them here or—directly from me if you live close by—let's have coffee! My next book signing will be on March 19th at the West Allis (WI) Library. they are hosting their first Author Book Festival. I hope you can make it. There will be gift giveaways, for adults and children, with a Question and Answer period. come and support myself and other Wisconsin authors! I believe in Christmas because I believe in the Gift Giver, and the Giver gave us Christ. It is Christ who gives meaning to our traditions. Long ago, Abraham was given a vision, and shown the stars of heaven. He was told that he would have descendants as numerous as the hosts of heaven. There was a gospel story in the stars of the sky; a virgin, a tempter, a Savior, suffering and redemption were written in the story that God, the Creator placed in the stars. As Abraham viewed the story in the sky, he was told, "from his seed would come a Savior." There are over 354 prophecies that have been fulfilled in Jesus. It is because of the purpose of His life, death and resurrection, that I can make sense of celebrating Christmas. Sure, I could get into giving presents and hope for some choice packages under the tree for me as well, but why? Just to pile up material hoarding and conform to shallow entertainment? I celebrate because I believe there is cause to worship the Giver, Sustainer and Savior of the World. Because of my gratitude for a life transformed, saved from selfishness and meaninglessness, from sin and sorrow, I have joy in both giving gifts at this time of year, and receiving gifts. But there is so much more to Christmas. Christmas is like celebrating a birthday, baptism, wedding, promotion, retirement, bar mitzvah and all other life milestones in one worshipful party. I believe in Christmas, because I'm alive and my life has meaning—to glorify and praise God with my being—mind, soul and spirit, until this life passes away and I enter the next. Eternal Life. Then the real party will start, and last forever! What an on-going Christmas celebration that will be! Since my book launch Tuesday, November 17th, I've had several opportunities to sell and sign my books for customers in the Waukesha, New Berlin and Germantown areas. Thank you to all of you who came out in some typical Wisconsin weather...sunshine, wind and rain, and slushy snow, all within about 5 days of each other! I now have my books at Martha Merrell's Bookstore in Waukesha, in the library at Elmbrook Church in Brookfield, and in the Little Read Book Store in Wauwatosa. Enjoy the Thanksgiving and Christmas holidays. Books make wonderful gifts!! Books are in, and ready to ship to your location! Just in time for the holidays too! Join me and friends at my Book Launch party on Tuesday evening, November 17th at Quaker Steak and Lube at 4900 S. Moorland Rd. in New Berlin, WI, between 5;30-8:30pm. Desserts will be provided, I will have books on hand and discounted for everyone who purchases one this night. On Nov. 21st, I will be at the Local Author's Showcase from 10am-2pm, in Germantown, in the Germantown Community Library Meeting room. N112 W16957 Mequon Rd, Germantown. Snacks and refreshments and events for kids. Meet local authors and buy our books! One more event, I will be back at Martha Merrell's on Dec. 5th during the final Art Crawl of 2015 in downtown Waukesha signing books for your stocking stuffers! I sincerely hope to see some of you at one of these events. I'd like to welcome you to my first blog ever, and my newest venture in book writing! A friend and I were discussing the growing problem of bullying in schools about seven years ago, and the seeds of this book were spawned then. My friend has a son who was picked on in school, not only by some classmates, but by a particular teacher as well. He was a little chubby back then, but a good student, well-mannered, likable. No children deserve unkind treatment. Like any responsible mother, she addressed her concerns for her son, to the teacher, the principal and others, and this problem didn't go away. She withdrew her son from the school and placed him in another, where he thrived, grew tall, became a handsome man and a successful citizen, and recently happily married. However, not all bullying experiences end like this...there are many tragic endings to a victim of bullying. The effects of bullying can be devastating to a young person, and I believe educating them about it's destructiveness starts very young—in kindergarten in fact. Awareness can decrease bullying activities in our schools and our society. I owe this book to Terese and her story, and hundreds of others with similar and even more tragic outcomes because of a bully situation. Take Sammy and Goliath with you, and learn from them, get intimate with the characters and create your own discussions with those you love. I have some possible suggestions to begin conversations about this topic in the back of the book.